"The problem with novels is that you can spend a whole year writing one and it might not turn out well because you haven’t learned to write yet. But the best hygiene for beginning writers or intermediate writers is to write a hell of a lot of short stories. If you can write one short story a week—it doesn’t matter what the quality is to start—but at least you’re practicing and at the end of the year you have 52 short stories and I defy you to write 52 bad ones. It can’t be done." Well, I set out to write a short story this past week, and I procrastinated, not due to lack of writing, but simply due to lack of my attention. I don't think the prompt I chose was interesting to me, and I just couldn't wrap my brain around it. Therefore, I will try again this week, and this time, I will choose something that makes me say, "Oh I like that, or Yes! I could do that." You get my meaning. week and see how it works for me. Also take note that a short story can be anywhere from 500 - 6000 words. It doesn't have to be a lengthy novel. Someone told me that they think of a short story as a slice of life. It doesn't offer the whole picture, just a snap shot or a portion, a story within a much bigger story. Okay I will refocus and next Friday there will be a short story here. Enjoy and do check out The Write Practice and see what he has to say. Browse his blog for some really good writing tips. And.....in the mean time, read a heck of a lot of short stories, like one a day, and it will improve your short story writing. I can do that. 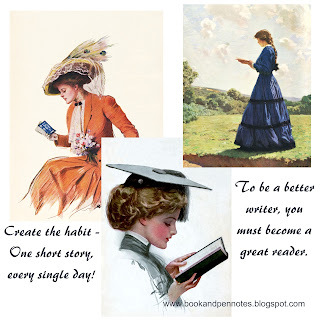 Here is a great link at The Write Life where he talks about reading one short story a day and how it can help your writing. Check it out. It is well worth it.